Role Model: “noun; a person looked to by others as an example to be imitated”. A role model is a source of inspiration, an aspiration, someone that encapsulates everything you dream to be, and everything you want from life. Role models come in such varying degrees, because everyone chooses someone different to look up to. Role models can also be the ones that help you realize that who you are is all that you need to accomplish great things in life. We choose our role models based partly on who we are, and part based on who we want to be. Whether you dream of having the star-quality of James Dean, the influence and power of Anna Wintour, or the ability to provide just that little bit more good to the world like John Lennon, our role models are with us from our youngest age, and grow and change as we do. One thing I never had in a role model when I was growing up however, was someone in the LGBT community that I aspired to be like, and who unknowingly let me know that it was okay to just be me. By no means does this imply that no gay role models existed in the 90’s, but for a shy boy living in the eastern suburbs of Melbourne, there was no one I was exposed to at my young age that had any influence over my feelings in regards to my sexuality. The only gay person I knew was a character on The Simpsons who wore a Hawaiian shirt and said “ZZAAAPPP!” a lot. In my childhood I grew up living and breathing AFL. God knows I couldn’t kick a footy to save myself, but every weekend my Mum and my sister would get in our Demons jumpers and we’d sit in the rain at the MCG. Brad Green’s number was on my back and he was the coolest guy I knew. Every Aussie kid knows and loves their AFL players, idolizing them and tracking their every on and off field success. There’s not a stat about these men that kids don’t know. Irish, Indigenous, Italian, their background is irrelevant to their fans, as long as they can kick, mark and tackle – they’re perfect. This is the reason why an openly gay AFL player would be the most stigma-shattering, invaluable thing that could happen in the game for the next generation of LGBT Australians. Knowing that a gay footballer can tackle just as hard, kick just as straight (no pun), and be cheered on by tens of thousands every week can help those battling within themselves know that sexuality is irrelevant in the game of life. It can also instill in those who barely grasp sexuality as a concept, that every single person is welcomed into society without consequence. People like Neil Patrick Harris, Ellen Degeneres and Wentworth Miller have shown the world that sexuality has no input whatsoever on you becoming the funniest, kindest, and best looking faces on television. 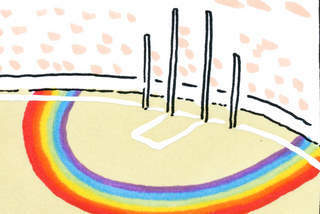 With our footy-charged nation, and the many LGBT fans that come this it, the game has already proven that it is as open and welcoming as its country of origin. Brock McLean and Daniel Jackson have already lent their voices and status to the cause, ensuring the message is sent that even the ‘big macho footy players’ support the gay community, and the next natural step is for an openly gay AFL player to come out publicly and show that the ‘big macho GAY footy player’ is exactly the same as every other player alongside him. The first player to do so will, in my opinion, be the bravest man in Australia right now. Just as Nicky Winmar gave the big (and figurative) middle finger to the racist few in the crowd, so too will this man deliver a message to the homophobes as he simply runs through the banner onto the ground. He is the one refusing to be hidden from public sight due to outdated and homophobic minority driven fear-mongering. The world is ready, Australia is waiting, and society is in the most accepting and loving place it has ever been. And a gay footballer in the paper isn’t gonna solve it all, but it’s a damn good place to start. Great piece and fingers crossed it happens soon!